The 18th Annual Okinawa Flower Carnival opened last Saturday and is scheduled to run through May 6. The opening ceremony was held in Nago City. At the ceremony, Okinawa Governor Keiichi Inamine said that the annual series of events is not only very pleasing to the eye but also an important tourist attraction. “While the rest of the country is in the middle of winter, we in Okinawa are lucky enough to have thousands of blossoms in full bloom,” the governor said. The slogan of this year’s event is “The paradise full of beautiful flowers makes also a paradise in your heart.” Each year various communities and public places are decorated with blooming flower arrangements to encourage tourism in the wintertime and to promote Okinawa’s natural beauty. Okinawa Prefecture and Okinawa Visitors’ Bureau sponsor the Okinawa Flower Carnival. Perhaps the best known event is the Nago Cherry Blossom Festival that this year takes place Jan. 27 & 28 in Nago City. The event attracts thousands of visitors every year to view the earliest cherry blossoms in the nation. Other events include: Oritori Flower Festival in Ishigaki City, Jan. 15 through Mar. 26. The opening of beach season and the Ishigaki Triathlon World Cup are part of Ishigaki City’s Oritori Festival. Chibana Rakusai Festival, Jan. 15 through Mar. 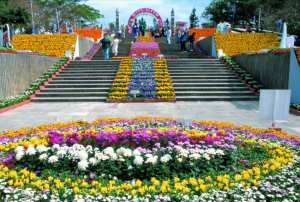 31, at South-East Botanical Gardens includes flower show on stage called ‘The Song of Okinawan Flower’ and various displays and exhibits. Gyokusendo Flower Festival, Jan. 13 through Mar. 31 features colorful flower arrangements and traditional Eisa dances. Flower and Aquarium 2001, Jan. 14 through Apr. 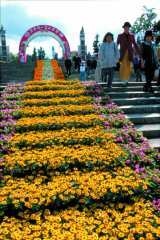 20 at Himeyuri Park features various animal characters made of flowers. Yambaru Tropical Park Flower Festival runs through May 6. Ikei Island Friendship Gardening Expo from Jan. 15 through Mar. 25 at Big Resort Ikei exhibits various flower arrangements. Nago Pressed Flower Contest 2001 takes place Feb. 19 through 24 at 21th Century Forest in Nago City.